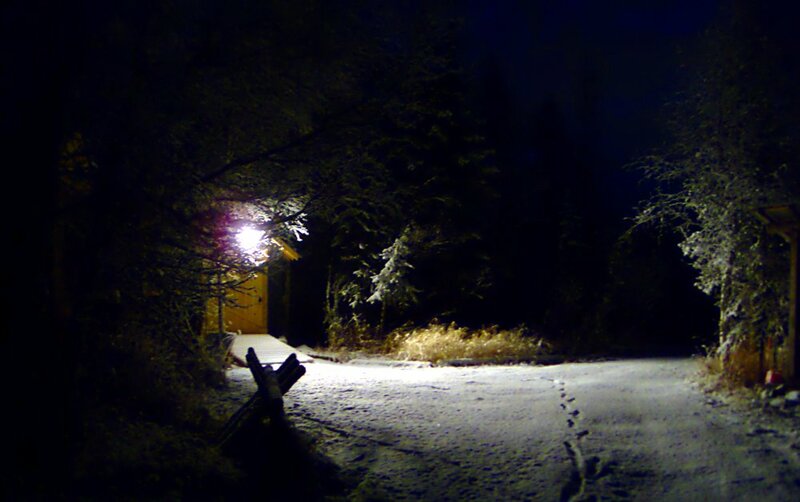 As you can tell from the photos I took today, fall is over and winter has started in Fairbanks. I didn’t get all my projects done, but this is one that’s been at the top of the list since I finished the shed. Because we’re so close to Goldstream Creek, we can’t have a septic field. Instead we have our own sewage treatment plant, built here in town by a company called Lifewater Engineering. It’s a great system, but we had some problems with our configuration last winter. Most notably, the discharge pipe partially froze. The plant has three sections: a settling tank where the initial waste goes, a section with a substrate and air blower to foster bacteriological growth, and a final tank where cleaned water sits until it’s discharged. A float in the last chamber triggers a submersible pump to rapidly pump all the cleaned water up and out, through he discharge pipe, where it pours onto the ground. The discharge pipe is insulated, and because it’s got significant pitch and the discharge happens all at once, the pipe is supposed to stay clear all winter. Unfortunately, the discharge pipe isn’t continuous; it’s three sections of ten foot pipe. 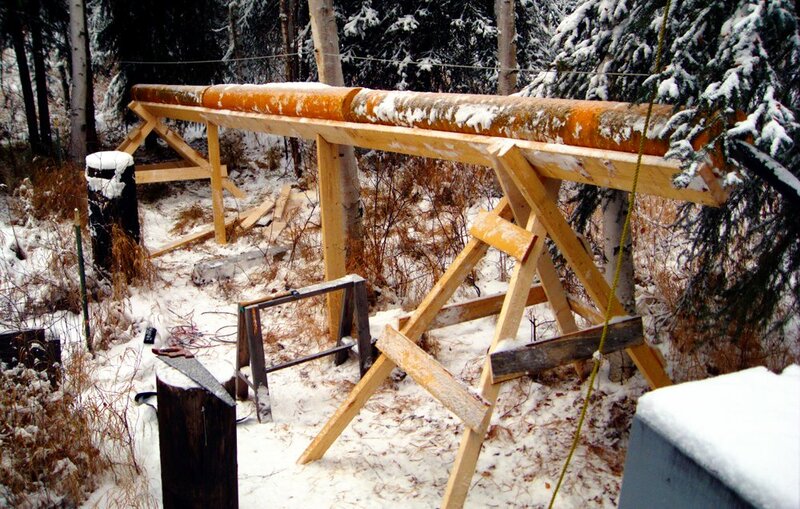 When the pipe was hanging from a cable strung through the trees, it was very difficult to keep the pipes connected well enough that water didn’t build up at the junctions and freeze. Last winter we had to disconnect the last section of pipe, and most of the water wound up under our house. To keep the pipe straight, and hopefully assist in keeping the water flowing downhill and out of the pipe, I built a 30 foot long trough by ripping a 45° bevel on the long edge of a series of rough cut 2x10’s. After offsetting the sides by five feet and nailing it together, I had a nice solid structure to support the pipe. I built the stands and intermediate supports today from 2x4’s and 1x6’s. This should make it much easier to work on the pipe if something goes wrong, and hopefully, it’ll keep the sections together and the water flowing. 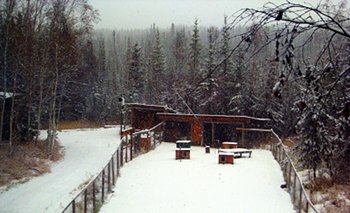 There are a few more small projects left—like insulating the vent pipe as it passes through the attic, and working on the interior of the shed—but with the snow flying today, it’s time to sit back and hope that this summer’s work was enough to keep the house operational through the long Fairbanks winter. A week or so ago we got a weather station (it’s the thing at the top of the pole on the left side of the dog yard fence in the photo) so we can keep track of the weather at our house. We’re one of the coldest places in the Fairbanks area, so we’re excited to see just how different our weather is. We’re sending the data to the Citizen Weather Observer Program where it’s ingested, analyzed, and disseminated by NOAA. I don’t know if they use it in their forecasting, but we’ve already shown up in a few Public Information Statements from the local forecast office. Full details on the station, with some plots and other data reports (I’m still working on most of these…) are at http://swingleydev.com/weather/dw1454/. The station code is DW1454 and shows up in MADIS as D1454. We got our first real snowfall last night, about two inches at our place. It probably won’t last (the second week in October is normally when we get the snow that stays until April), but it means the roads will be dangerous for the next couple days or weeks. Last week we saw our first great horned owl of the fall, and the snowshoe hares are rapidly turning white so winter is just about here. We’re hoping for a bunch of early season snowfall this year to get the trails set up for skiing and mushing. What’s cool about the first snowfall of the year, especially when it’s a lot of snow like last night, is how totally different the world looks. You go to bed and it’s painted in yellows and browns, but when you wake up, it’s all cleaned up in black and white and blue. I know it’ll melt, probably later today and turn brown again, but as the sun comes up on the new wintry world, it feels fresh. I finished wiring the shed yesterday afternoon. I was surprised at how long it took, but since everything is connected in series, each connection has to be perfect or nothing down the line will work. I’ve lived in enough cabins with funky wiring to know that it’s better to do it right the first time. The shed now has an outlet on each wall, an outdoor GFCI outlet on the outside of the building, a pair of lights in the ceiling, and an outdoor motion-detecting floodlight (that’s what’s lighting the photo on the right). The lights are wired to a switch next to the door. All that’s left is to clean up the inside and build what we need to store stuff in there. We’d planned on painting the floor, but I think it’s too late in the year for that now. For the last month or so I’ve spent the majority of my time outside of work working on our new shed. It’s a sixteen foot by sixteen foot building with full eight foot walls, a nice high ceiling, a pair of small windows, and a large barn door. All of the materials came from Northland Wood here in Fairbanks, and except for the plywood and some sundries, the wood is locally harvested and milled white spruce. I got the barn door hung last night, and today I built the ramp and added some window trim. 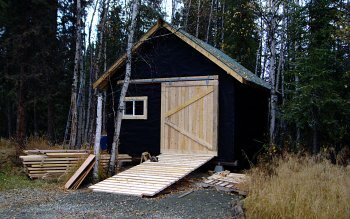 All that’s left is a layer of tar paper on the back wall, installing a locking mechanism for the door, and doing the electrical work. It’s certainly the biggest project I’ve ever completed, and I can’t help but smile whenever I walk past it. I took a lot of pictures during the construction process; some of the better ones are at this web page. 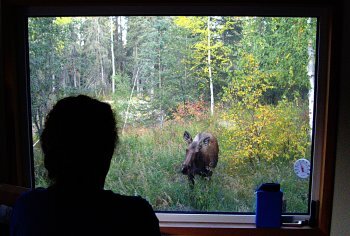 With hunting season about to start in the Interior, we got a great view of a cow, calf and bull moose from the comfort of our large windows. Last night I chased a solitary cow away from the dog yard, and this morning a different pair showed up. The cow and calf grazed on birch leaves and fireweed next to our west window, then wandered down the dog yard fence toward the road. When they got to the trees near the far side of the dog yard, a small bull showed up and briefly chased the calf. The bull wasn't legal (and it wouldn't be legal in our yard anyway), but it's the first male moose we've seen at the house.